Brandon rockin’ up the lavender plant! He is adding rocks and sand around the lavender plant to help it to drain well. Rock on Brandon, rock on! Two good men hard at work making dog biscuits for No Limits’ Hot Dogs for a Cause Fundraiser! Next Thurs. 3/21, from 11 am – 2 pm, No Limits’ members will be selling hot dogs, plants, and pet treats at our office in Tasley. Proceeds from this event will benefit the Eastern Shore Coalition Against Domestic Violence! Corina is having a baby! In order to wish her well No Limits members and staff bought her a gift card so she can purchase items for her and her new little one. Bagging up biscuits before the buses came! Our Board Chair, Liz Walters, donated several interesting magazines to No Limits this week. We took a few that we really enjoyed and donated the rest to a local thrift store for others to see! Our ornamental pear tree is blooming! Spring has sprung! Brandon planting perennial sunflowers in the No Limits’ garden. Tree selfie! Kyle and Brandon, both Eastern Shore of Virginia Master Naturalists, volunteered with fellow Master Naturalists to plant native trees in Cape Charles this week! Brandon helping to plant a Scarlet Oak tree. Plant on Brandon! Brandon “chillin'” in between tree planting. He says that in this picture he was on the back of the “tree tractor” which carried the human volunteers and trees from place to place during the planting session. Great work Brandon and Kyle! Jack Jack aka our good pal Jackie had a birthday too, so we visited with him to celebrate as well! It’s getting warmer… which means we’re starting to add on to our outdoor garden! Brandon is planting lavender in No Limits’ dedicated herb garden! Kamesha from the Virginia’s Cooperative Extension’s SNAP-ED program came in to give another cool lesson on nutrition this week. We learned about fruit and made fruit smoothies that were mmm mmm good! Thanks Kamesha! The group working on a crossword puzzle together on our smart board. It was difficult but fun! Adrian helped out with some hard work too. Great job men! Our native purple passionflower is growing “wild and free”! We can’t wait to plant it in the No Limits Pollinator Garden this spring! One of our spring plants has arrived. Yay! Welcome to our new Purple Gem Azalea! Brandon planting the purple azalea in its new home – the No Limits Pollinator Garden! We can’t wait to see it flower. Oh no there’s a leopard in here! Oh! Just kidding, it’s only Amy’s jacket, hahaha. Amy the leopard in her indoor jungle. Rawr! Lookin’ good Amy! Zel helping with the indoor garden. Great job Zel! Green Thumb Brandon caring for many indoor and outdoor plants. Plant on Brandon, plant on. Friday morning lessons with Adrian. This week we learned a whole lot about Tangier Island and the tidal events that happen there. It was really interesting, thanks Adrian! It might be February but we are prepping for spring here at No Limits! We planted several types of tomato and pepper seeds so that the seedlings will be ready for spring planting. Brandon also helped to take cuttings from a rubber tree that was donated by No Limits’ Board Member Laurice Hohlt! Thanks Laurice! It has been a very productive week! We assisted in Comfort Doll creation for the Kiwanis Club of Accomack and also finished another cat bed made with a donated sweater to deliver to the local animal shelter. Thank you to the Kiwanis Club of Accomack for the opportunity to continue working on such a rewarding project, and thank you to Anita Allen for donating sweaters to make cat beds! 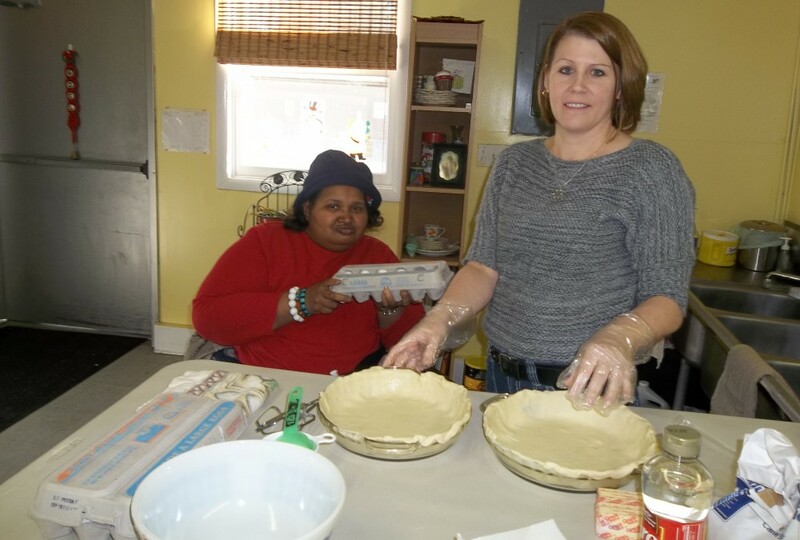 The Kiwanis Club of Accomack also donated Girl Scout cookies to No Limits’ members this week. Yum! Thank y’all so much! Spring cleaning early. CL made sure the kitchen chickens were scrubbed clean! David assisted in “detail cleaning” the microwaves. Good work men! Long-time member of No Limits, Brandon, as well as No Limits’ Board Member, Laurice Hohlt, brought Valentine’s gifts for everyone this week. It was so sweet – the candy and the thought! Haha! David had Emma cracking up while we learned to make homemade beef jerky. What was so funny we wonder?! We made homemade jerky this week out of ground beef and donated jerky mix/seasonings donated to us by John and Rachel Evans (our Executive Director). Kyle is making a funny face because Brandon told him that he was holding the jerky like a baby, haha! Brandon rolling out the jerky meat into strips. Roll on Brandon! Our finished jerky! It is so delicious. More please! Betsy Pinder recently took a trip to Guatemala and she brought back spices to show us before we began our United Way Exercise Group for the day! Betsy shared some really interesting facts about her trip with us. It was really informative and fun to learn about where she traveled to. Thanks again Betsy!